The following table describes the Oracle ILOM properties that determine how POST performs its operations. Note - The value of keyswitch_state must be normal when individual POST parameters are changed. The system can power on and run POST (based on the other parameter settings). This parameter overrides all other commands. The system runs POST based on predetermined settings. The system cannot power on. The system can power on and run POST, but no flash updates can be made. Runs POST according to diag_level value. Runs POST with preset values for diag_level and diag_verbosity. If diag_mode = normal, runs all the minimum tests plus extensive processor and memory tests. 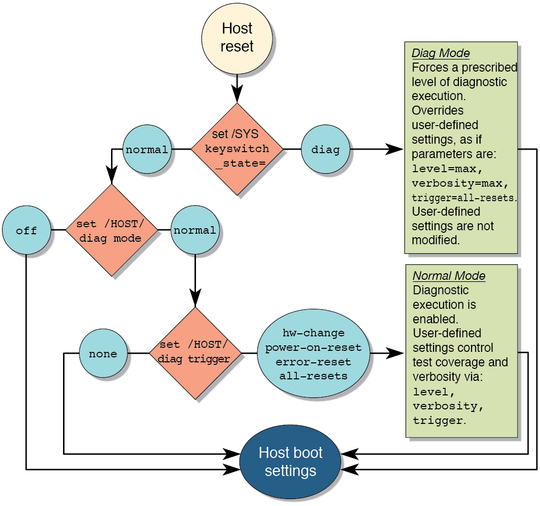 If diag_mode = normal, runs minimum set of tests. Does not run POST on reset. (Default) Runs POST following an AC power cycle and when the top cover is removed. Only runs POST for HOST power on. (Default) Runs POST if fatal errors are detected. Equivlent to power-on-reset, hw-change, and error-reset. POST output displays all test and informational messages. POST output displays functional tests with a banner and pinwheel. POST displays all test and informational messages. MAX POST plus debugging messages. No POST output is displayed. The following flowchart is a graphic illustration of the same set of Oracle ILOM set command variables.